Seems appropriate. Even though Park himself is a zealous debunker, his words still resonate as true. I don't trust debunkers any more than "true believers." We must, in all things, keep a rational mind and not let ourselves be carried away by either our fears or our hopes. For more than a century, tales of hairy, wild apelike men have emanated from remote corners of former Russian territories such as those bordered by the Pamirs in the Southeast and the Caucasus to the Southwest. One such little-known region is the Republic of Daghestan. Located in the North Caucasus mountains, Daghestan lies in the extreme southwestern portion of the Russian satellite republics. The word Daghestan translates appropriately as "country of mountains". Appropriate since the highest point, Bazardyuzi Mountain, peaks at 14,652 feet and much of the country's interior is comprised of steep, mountainous terrain that ranges from arid scrub to alpine forests. This extreme geography leads to an unusually high percentage of ethnic diversity, with more than 13 distinct groups living there today. Some of the most isolated Daghestani tribes still live a fairly unchanging exitence. Given all this, it is little wonder that the Russians have, for years, been investigating tales of hirsute humanoids or "Wild Men" that periodically emanate from here and other rocky corners of the former Soviet Union. And, it seems, the Russian government and its scientists have always been far more open to the likelihood of these creature's existence. In August 1959, a Soviet expedition from the University of Kiev sponsored a expedition to Daghestan to confirm local reports of hairy beasts that had been roaming the glaciers and mountains there. Locals recounted that these creatures would descend from the hills to steal potatoes and corn husks. In 1925, as Russian troops hunted the White Army through the Pamirs (over 1500 miles east of the Caucasus), General Mikail Stephanovitch Topil'skiy's troops shot an ape-like creature as it emerged from a cave. Upon examination by the medical officer, it was determined that the unknown creature was 5 1/2 feet long with a covering of dense gray-brown hair. He also described dark eyes, large humanoid teeth and a prominent, sloping brow as well as protruding jaw and a flat nose. These "relic hominids," as some call them, are believed by investigators such as Ivan Sanderson, Myra Shackley and Bernard Heuvelmans to represent the presence of living Neanderthals. If descriptions such as this are to believed, they do seem to bear a striking similarity to our current scientific view of how Neatherthal looked. Could such a thing be possible? Do relic Neanderthals roam the hidden valleys and mountain passes of Central Asia? 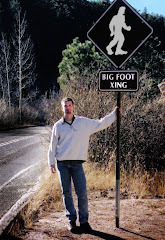 If so, can they explain similiar sightings across the globe or are we looking at a multitude of creatures that make up what we collectively lump together as Bigfoot, Sasquatch or Yeti? With the outrageous coverage it has received, I first felt I would not talk about NASA's "man on Mars" image. However, Yahoo! today posted an ABC news segment that talked about the image in such open-ended terms as to intimate that no one knows what it is, leaving it to the viewer to decide for himself. So now we will see another "mystery" enter the fold before our very eyes. A mystery that will doubtless haunt the blogs, the magazines, the chatrooms for years to come. Perhaps it is closed-minded of me but I quite simply see a rock - a tiny one at that. Not many of these news reports are showing you the size of the "man" in relationship to the rest of the picture. It has been approximated that the little fellow is only four inches high. Unlike other cases of mistaken identity or wishful thinking, this newest sensation is, as one might expect in the new age of Yellow Journalism, a product of the media. It was not a long-forgotten image, found among the clutter of stored away byproducts from 1970's space exploration. It came to the forefront of the world conscious via the media and has stayed there since because of the media. It now lies at the sticky bottom of journalistic integrity messily adhered to lurid stories of Britney Spears and the manufactured scandals surrounding the late Heath Ledger. There was a time when this sort of reporting was left to lesser souls at grocery store rags such as The Enquirer or The Weekly World News. However, now one can find ABC, NBC, CNN, and many others raking this muck in their quest for the almighty rating. After all, they are competing fiercely for your attention amid a score of news broadcasts and countless websites. Okay, maybe I'm overstating the dilemna a bit - just a bit. Maybe I'm just sick of seeing 24/7 coverage of Britney Watch 2008, Clinton and Obama fueding like rabid dogs over a mouldy bone, and, of course, that stupid little rock. An Ancient Assyrian Connection To Mothman? 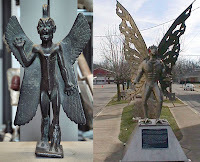 Is there a relationship between ancient depictions of the Assyrian god Pazuzu, king of the wind demons, and 20th century sightings of the Mothman? If you get a chance, it is an interesting, if not terribly credible, read. One might be surprised to know that more than one cryptid creeps about the dark confines of Puerto Rico's El Yunque National Rainforest. Read about this far rarer creature HERE. 40 miles southwest of the Dallas/Ft. Worth metroplex lies Stephenville, TX. 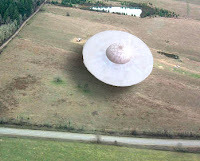 It was in this small ranching community that dozens of eyewitnesses spotted a UFO on the night of January 8, 2008. Witnesses described the object as flat and metallic with steady red lights and flashing white lights along its surface. Although officials from the Joint Reserve Base Naval Air Station in Fort Worth believe these percipients merely saw a commercial aircraft, local citizenry adamantly refute such an assertion. They claim the object moved far too fast, too quiet, and too low. One witness, Ricky Sorrells witnessed the object hovering approximately 300 feet off the ground over a field behind his home. Given the proximity of the event and it's occurrence only one week ago, one might keep his/her eyes peeled for sightings over Oklahoma in the coming days. I didn't catch last night's premier of Ghost Hunters International. I tried to view it on the website but they were having problems. So, for the moment, I cannot comment on this new branch of the show. At first, I thought that perhaps the old team were getting out of the "biz" to focus on family more (a lament they often proclaimed) but, as the commercials attest, a new season will be starting up soon. I am also excited to see that they will be launching a UFO Hunters later this year. I curious to know how that's going to work out since, by and large, UFO's are far rarer than haunting phenomena. One cannot simply go to a give location and expect to see them as you might with a haunted house. If it is investigations of documents, photos, videos from the past, then they will have to try VERY hard to impress us with something we haven't seen before. That is all very well traveled territory. If all of these shows (Monsterquest, Ghost Hunters, Paranormal State) could manage to find their respective ways onto the same cable network, that would just be fantastic. Ghosts, etc... aren't exactly science fiction (SciFi) and I simply don't get A&E's focus anymore. At least the history channel delves into the history of paranormal phenomena and the travel channel shows you the various paranormal locales one can visit. Still, if they'd put it all on one channel that would be great. Although, I realize that the cryptozoologists hate the term "Paranormal." Q: "Why aren't there any Sasquatch bones found?" Why had no bones been found for any of the recently discovered species in the mountains between Laos and Vietnam? In addition to the rarity of these animals, the regions in question are often sparsely populated and a handful of hunters or loggers aren't going to cover every inch. If they do stumble across bones, are they going to immediately recognize them once they've been disarticulated, broken, scattered by scavengers and ultimately buried beneath the accumulated debris of the forest? Will they possess the training to discern the differences between the femur of one species and that of another? Will they even care? Or perhaps they bury their dead. We know nothing of any social organization or rituals they may have. Perhaps the elderly, infirmed or injured stay close to a troop that cares for them and, if necessary, buries their remains to either honor or, at the very least, protect them from scavengers. Even early humans buried their dead beneath rock cairns and loose soil. Perhaps like elephants, these creatures have collective "cemeteries." A necropolis of sasquatch remains may lie hidden somewhere beyond the reach of man - perhaps at higher, inaccesible elevations or beneath us in uncharted caverns. The best answer though might just be that some do claim to have found the bones of Sasquatch. * However, these often end up being identified as something else. But at least a few remain "unknown." Albeit, they aren't usually given more than a cursory visual examination. However, if under further analysis any specimen remains unidentified, we may find ourselves with a significant piece of evidence. Until such a time when physical remains or compelling DNA is collected, we will be left solely with the trace evidence that has, up to this point, been wholly inadequate at drawing the interest of the greater scientific community. It is a problem we can attribute as much to hoaxes as to any dogma on the part of scientists. This preview makes me want to track this film down. Unfortunately, I have been unable to confirm general release and distribution. 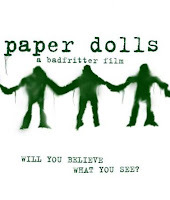 IMDB states that it was released in July 2007 but I cannot locate it for sale or rent on DVD. If you know of this film, I would love to hear from you and get your opinion. "One cannot deny that, logically speaking, undetected trickery, undetected natural causes, undetected malobservation and undetected lying may lie behind all reports of poltergeist phenomena. But to assume withoust supporting evidence, and despite numerous considerations...to the contrary, that they do lie behind them, is to insulate one's beliefs in this sphere from all possiblitiy of modification from the cold contact of chastening facts. It is to adopt the paranoid stance of the flat-earther or the religious fanatic, who can 'explain away' all the awkward facts which threaten his system of delusions." Honored, Humbled, and ... Confused. 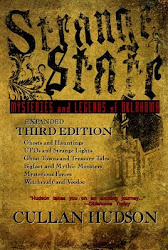 Coming as a total shock to me is the inclusion of Strange State: Mysteries and Legends of Oklahoma in Loren Coleman's list of Top Cryptozoology Books of 2007 over at CRYPTOMUNDO.com. I have to say, I am both surprised and honored. I'm also a bit humbled and confused. I just don't know what to make of it. Therefore, I will simply extend my thanks to Mr. Coleman and whomever else was in on the selection process. Although, we may not always agree, I certainly do respect the tremendous effort he has put forth in establishing forums for the serious discussion of cryptozoology. 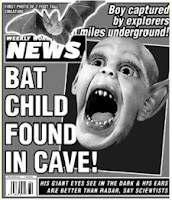 Without individuals such as Loren Coleman, we would be left with little more than tabloid accounts of crossbred Bigfoot babies and Bat Boy. PS, I just COULD NOT resist using that image for this post. God, I love that picture! Check out this fun design. It would make a great T-Shirt or Mug!